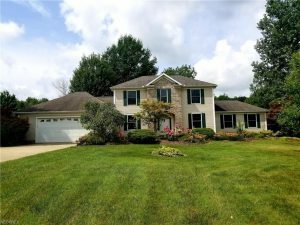 Amazing 4 bedroom 3 bath home in Perry. The 14 x 26 ft. eat-in kitchen has beautiful french doors that opens to the deck and back yard. The kitchen has solid oak cabinets newer appliances that stay and a Large Center Island and two pantries. There is a first floor Master bedroom and 3 possible 4 large bedrooms upstairs. Storage is endless including five walk-in closets. The Laundry room is also on the first floor. Hardwood flooring is in the Formal Dining room and foyer. There is a 3 car heated garage. New furnace and Air Conditioning installed in 2016 and 1,454 sq/feet of Nature Stone flooring installed in 2016. This home is “Turn “Key” and waiting for that special buyer who appreciates a well maintained, quality built home in a park like setting! This home is truly in one of Perry’s most exquisite Cul-de-sac neighborhoods.